Here at Navajo Nation Division of Natural Resources Energy Summit at Twin Arrows Casino & Resort. Navajo Nation President Ben Shelly is speaking. We are being told not to burn coal. so maybe we should export coal. china and even russia came over. we’ve done international trade with NAPI. We were told not to sell to communist countries but we did it anyway. i asked attorneys to look at constitutions. large land based tribes asked what to do in trade area. we asked attorneys about exporting coal. the 13 colonies wrote in constitution that indians needed to be in constitution, trade and commerce provisions. so large land based tribes said let’s start trading with other countries. but we didn’t see. why? are we too relaxed cuz of federal red tape. we can’t exist like that anymore. our kids are knocking on doors for jobs. they can’t expand their knowledge, their education. we have gone through our lives. the young are here, they want jobs, they want to build a nation instead of thinking that we are comfortable. that is not the ansewer. there are a lot of things happening. we have 200 year supply of coal from Navajo Coal Mine. We have natural gas and everybody wants it but we are stopped by Navajo and federal red tape. we are going into clean technology and it’s environmental friendly. all these activists saying no but they can’t say no now. we have to build our coal mine. EPA will shut us down if we don’t use coal mine. other one is carbon sequestration. I don’t know if Southern Company successfully. we went over and saw them clean off harmful stuff off it. Also CO2, they call it. think of it this way, you all went and paid for house and dog house and you opened can of paint and it’s real thick and you stir up and use paint thinner so they are using to replenish abandoned oil wells. when got to certain level of oil, it was too thick and so using CO2 like paint thinner. we cud do for Desert Rock as carbon capture plant. other one is alternative energy, like wind, politicians full of wind. we have places, like Big Boquillas where surveyed and ready to go. in new mexico we have paragon ranch and it’s ready to move forward with wind. they’ve been studied to death and those are ready for funding. if anyone here from federal energy department, we just need funding. we have list. General Electric cleanup is another way to put away radiation, harmful stuff. federal government didn’t tell people that uranium dangerous and that was wrong. and now animals are contaminated and we eat. it’s up to US to fund cleanup. and navajo people will do cleanup. we have 40 navajo people trained. very expensive job and cuz no one wants to do. other one is BHP Coal mine. we can export coal, gasification, coal to liquid, we can sell all those. and there are more stuff out there. if there are businesses are that know about that then talk to NTEC or ITEC, which one is it Fred? get your heads together. tribal code can’t stop you. those are out there. and other one is Santa Fe rail port. Navajo bought 300 acre plot in Thoreau, my hometown. the reason so successful is cuz doing in phases. phase one is 300 acres by Burlington railroad and so we plan to build warehouse and homes for workers and railroad spur. that is phase one and we have investors, NM Dept of Transportation, SAn Juan and McKinley Counties, people pumping oil in Farmington and pple that want to use. Phase 2 is hard to do cuz eastern navajo in checkerboard area but lot of allotees live off rez so use right of way for state road 371. so san juan and mc kinley counties said look into and they said okay to use. they support cuz New Mexico state spends million on highway repair cuz of semi-trucks. they said that four semi-truck cud fit into one train box car. we are trying to avoid tribal politics and red tape. so that is where we are on that. we were offered partners with Tres Amigas, three ladies, which is transmission line across rez. When talking Desert Rock, there was an idea to build transmission line all the way to California for Desert Rock to transport energy and sell it, like stock. people buy electricity. it cost millions to build. it’s there but what’s missing. US energy department said that if build that navajo would get country on their feet. if talking about cleaning earth, here is the offer. that grid line can be used to sell their energy generated by alternative energy. i’ve been saying in this DC and over and over. i’m starting to see positive response from Dept of Interor and hope to see dept of energy join. the problems with indian tribes all over US is right here, federal red tape, code of federal regulations. the navajo nation is big enough. you all watch games – football, basketball – but you have resources to put a team together. an energy independent energy team. we are just as good as anyone to play with other teams. we just need to wake up and play with the big boys. we are always striving for money. investors ask us where is your money Navajo. we have permanent trust fund. talking about big boys. why not create bank. there are loopholes that we can bypass to buy bank which gives loans and we pay back. we cud eliminate tribal financial bureaucracy. now we are with big boys. why not bring all casino tribes together and build bank and use like medicine wheel or wagon wheel to provide funding for our people and non Indians. may not happen overnight but if fortunate enough then we will see. earlier i said Navajo Tribal Utility Authority. true sovereign is taking control away from outside. Oh man, we have a lot to do. you need to wake up and that is idea behind energy summit. people that are homeless and jobless, need to get to the top of that hill and see all the opportunities out there. we need to wake up, my brothers and sisters. you have right here before you. look and study NTUA if you don’t believe me. we’ll be criticized by federal tax office and federal government: hey indian when you going to get a job? Open your minds. It’s right before you. remember this, get yourself a red tape, look it and make those changes. 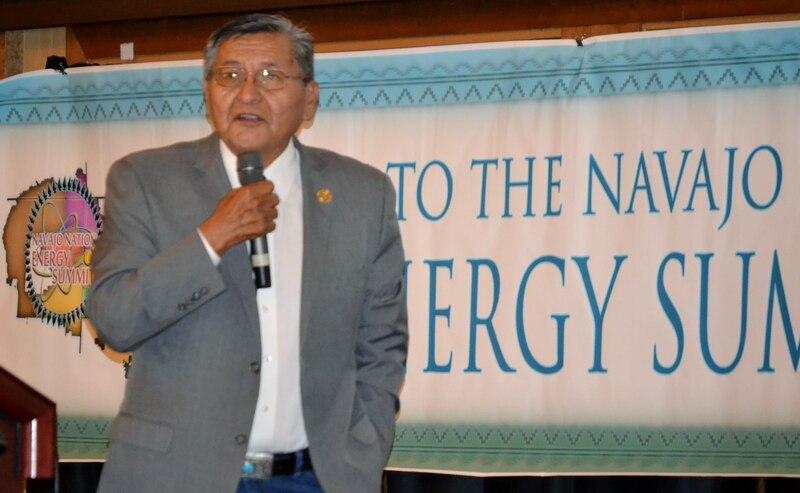 This entry was posted in Professional Journal and tagged BHP, coal mine, economic development, energy, Navajo Generating Station, Navajo Nation Council, Navajo Reservation, Navajo Transitional Energy Company, NTEC, President Ben Shelly by Marley Shebala. Bookmark the permalink.